The death of a child, of any age, brings heartbreak and devastation. But if your child dies by suicide the fact that they seemingly 'choose to die' makes this even worse, You may discover things that they kept hidden form you, you may blame yourself for not realising they were so unhappy, you may feel you are being judged as a parent, but whether your child died recently or some time ago, PIPS Hope & Support Bereaved Parent Support is here to help you find hope, healing, peace, and a way forward. We offer a face to face bereavement support service for families where your child or young adult has died by suicide. 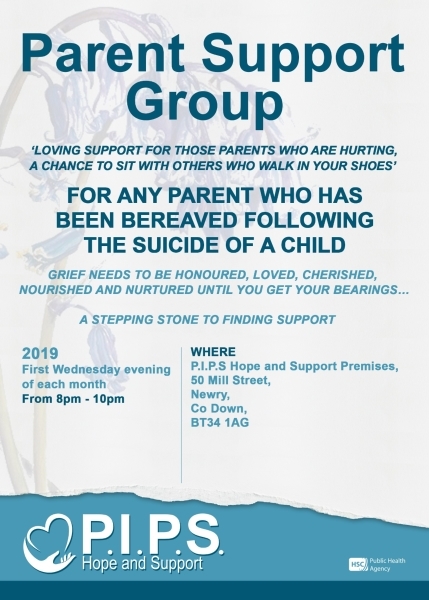 Most of the experts agree that the best thing to do following the loss of a child especially to suicide, is to find a support group that understands and that can help the bereaved parents cope with the feelings that they may have and yet not understand very well.